U.S. Mail Supply offers locking heavy duty metal commercial & residential mailboxes for shipping to New York at excellent rates. Shop indoor horizontal and vertical mailboxes or outdoor pedestal mailboxes with USPS approval or for private delivery only. Our mailboxes are ideal for multi-unit residences like apartments, condos or town home subdivisions with central locations for mail delivery. 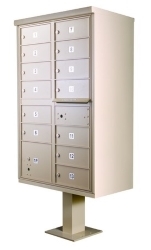 Whether you’re after an interior surface mount, recess wall mounted horizontal mailbox in a lobby, or a big outdoor pedestal mounted mailbox system, we’ve got the inventory to make it happen. 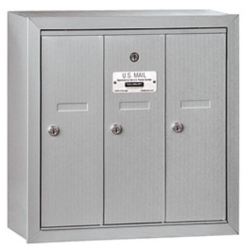 U.S. Mail Supply offers a wide variety of commercial mailboxes for sale, including indoor horizontal and vertical mailboxes and outdoor pedestal mount, lockable mail box units for apartments or other multi-unit buildings. 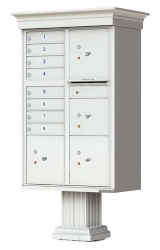 Shop USPS approved 4C horizontal mailboxes or 4C pedestal mailboxes for private delivery. A great option for durable indoor mail delivery for apartment complexes, schools, offices or other business applications. The U.S. Postal Service places strict restrictions on what mailboxes qualify for USPS approval. Pre-approved mailboxes offer easy installation with peace-of-mind knowing you’re in compliance with USPS regulations. 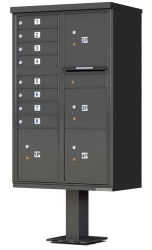 Shop elegant vintage or Victorian style decorative pedestal mailboxes for luxury and high end apartment complexes or modern Vital™ F Series pedestal mailboxes for any multi-tenant mail system. Buy heavy duty durable steel & aluminum outdoor pedestal mailboxes for big mailbox systems or large single-box mailboxes for small businesses or apartment buildings. 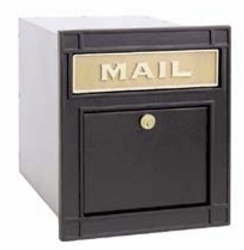 Indoor mailboxes for sale from U.S. Mail Supply include customizable secure horizontal and vertical mailboxes for storing internal employee documents or USPS mail packages. 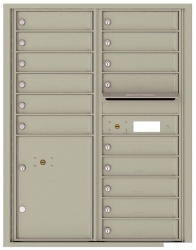 Shop traditional post mounted locking pedestal mailboxes for the curb or elegant, wall mounted steel mail houses for secure mail storage at single or double family homes. 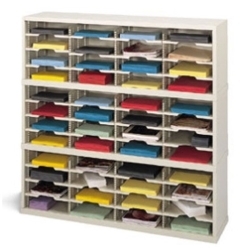 U.S. Mail Supply’s stock of mail sorters includes open and closed back options to help keep mailrooms, classrooms and office environments better organized. Durable steel & aluminum construction make for a high security storage solution. Mailboxes are vulnerable to physical attacks and ongoing exposure to harsh weather. Our tough metal mailboxes are up to the task with sturdy construction and security features to keep mail, documents and personal belongings safe from any harm. Please contact us if you need any assistance finding the right mailbox for you. 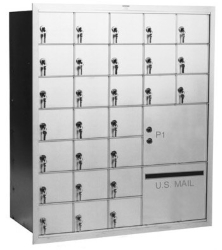 U.S. Mail Supply offers a variety of outdoor pedestal style mailbox units and private use indoor mailbox units for New York commercial businesses and residencies. No matter what your needs are, we have the mailbox unit for you – outdoor pedestal mailboxes are durable options, available in a wide variety of configurations and styles from decorative to standard. Indoor mailboxes are built with aluminum and stainless steel, with the option of either rear loading or front loading, depending on your application or preference. U.S. Mail Supply, Inc. is a leading distributor and manufacturer of commercial and residential mailboxes, post office boxes, mail sorters, and more. Give us a call today to learn more or to find the right mailbox for you. We’ll help you formulate your specific needs to find the ideal solution, then send you an illustration of how your new mailbox will look and what it will cost. If you need any further assistance finding the best mailbox units for your building, please contact us and we’ll help you figure out exactly what you need.